Ok, I have to admit- after the exciting results from my DIY Windmill Project, I became obsessed with the spray paint I used. And so, while this newest project isn’t exactly complicated- it’s one of those “DUH!” projects that is ridiculously simple, but warrants a post nonetheless. 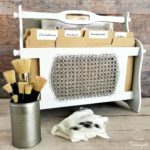 Even though our home décor isn’t “farmhouse” style, I couldn’t shake the idea of trying my hand at a DIY farmhouse Easter basket project. But after LOTS of thrifting and vintage shopping, I was left empty-handed…I simply couldn’t find a good wire or metal basket to use. BUT…but…there is always a plethora of regular fiber baskets that positively litter the thrift store shelves. 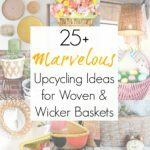 So, why not do a little “upcycling alchemy” and turn those fiber baskets into “metal” ones? This post contains affiliate links for your crafting convenience. I selected a few baskets for my experiment- in different sizes- and set about trimming off handles and woven pieces that were jutting out. When all the trimming was said and done…it was time for the alchemy! Could the fiber basket be transformed into metal with just my favorite spray paint? And, well, yes- yes it can be! The photo doesn’t really do it justice- there are nuances in the finish (like weathered, galvanized metal) that you can’t see. But in just a couple of hours, I had a “metal” basket for the cost of a regular one. I don’t even know what I’ll do with these others, but I couldn’t help myself- the repurposing alchemy was too much fun! (And I’ll finish them with a matte clear coat to make them even more realistic). Let’s build a farmhouse style Easter basket! And on top of the filler, I added some ceramic/decoy chicken eggs to complete the farmhouse Easter basket look! Doesn’t that look fantastic? And kinda-sorta like an authentic metal basket! …and good for year-round farmhouse style. Now you understand why I love this paint so much! It makes farmhouse style so much more achievable for thrifty types like me. That spray paint is fabulous for the faux galvanized effect – which seems to be one of my current obsessions. I love how the little squareish open weave basket turned out. I had no idea ceramic nesting eggs were a thing and I’m so glad I know it now! It’s magical stuff, I tell ya!!! Thanks, Kathy! I never go to Dollar Tree because try and buy secondhand as much as I can, but good to hear you found one! How cute was these. I love metal baskets and they are hard to find and when you do they certainly are not cheap. I love this idea and thanks for sharing it with us as usual. Clever makeover of those baskets, & you’re right, the thrift stores are brimming over with them. Think I’m going to have to try this! Great idea! Thanks for sharing on the Pleasures of the NW’s DIY link up! Now I have to go buy some spray paint! I love the effect, and the fact that it doesn’t break the bank. Pinning! Cute project! I never thought about using metallic spray paint on baskets. It makes them look a little bit like galvanized metal buckets. Those baskets are super cute! Now I want to go to the thrift store and see if they have baskets!! You saved a ton of money on this project! Do you have a spray tent or do you so all your spraying outside? I just spray outside. Since most of my projects are small, I set up sawhorses and my heavy cardboard “table” that I paint on. Bending over doesn’t agree with my back, so this way is ideal for me. Oh, I never would have thought to paint them to look like metal. I have painted a wicker picnic basket red. Love me some red! I love a good red paint job, too! 🙂 Thanks so much, Laura! super cute! When I first saw it, it reminded me of one of the galvanized olive buckets! Spray paint is a miracle worker. Your baskets are so realistic. Thank you for sharing your wonderful idea with us at Vintage Charm. Hahaha, if only I had a nickel for every time I said that about another blogger’s project! 😉 Thank you so much! Great idea! I love that spray paint. I used it on a Christmas designed metal bucket and was very impressed with the coverage and the realistic look. These turned out great! Thank you for sharing with us at the To Grandma’s house we go link party – you’re going to be featured when the next party starts tomorrow morning! These are fabulous baskets. I love the makeover, the beautiful color you choose. Thanks for sharing. Brilliant! Isn’t spray paint amazing?!? Pinned and sharing. Thank you for joining us at Family Joy Blog Link-Up Party. I hope you will join our next party starting Sunday at noon EST. I’m never passing up another yard sale basket! Thanks!